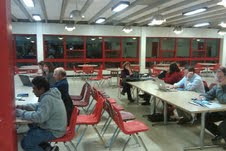 Our second Technology Workshop for parents was a great success last night. We explored Google Reader, Google Docs and allowed parents to use some iPads as we consider it as a possible device for our 1:1 initiative set to kick off next fall. If you were unable to attend last night's session, I urge you to check out the two videos below which can help you get started utilizing Google Reader and Google Docs. The video below is a great introduction to Google Reader. If you like what you see and want more short tutorials, Google has a few more videos on Google Reader on their Google Reader Help YouTube Channel. The video below is another intro. video, this time to Google Docs. Google Docs is easy to use and it will simplify your life. In addition, you can upload any word documents that you already created into Google Docs quickly and easily. You can find additional support on the Google YouTube Channel for Google Docs and a number of other Google applications. Dates have been set for our next five Technology Workshops for parents. We will meet on January 4, February 1, March 1, April 5, and May 3. Our January session will focus on Twitter and and other social media tools that we feel are useful. If you would like to get a jump on next month's session, you could watch this quick introduction video, Twitter in Plain English. We also welcome your input for future topics that you would like to learn more about. In the interim, please feel free to call me at 339 234-1673 or e-mail me at burlingtonhigh@gmail.com if you have questions or would like support on any technology-related issues.